Primary Natural Resources phosphates, potash, shale. JORDAN IS A MIDDLE Eastern country located in southwest Asia. 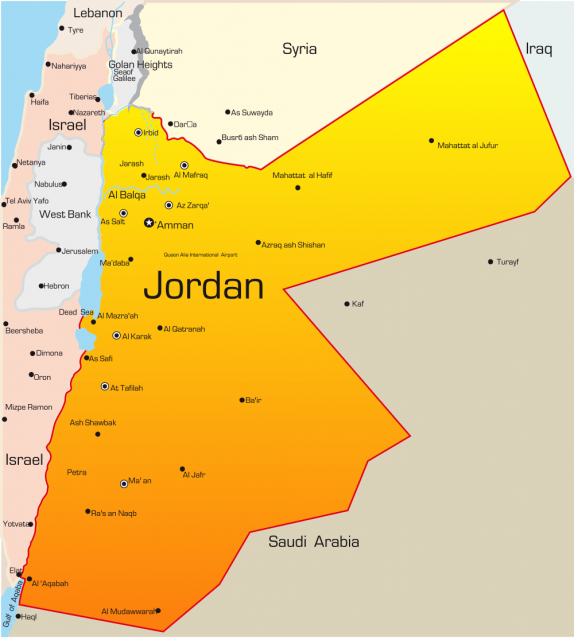 Its official name is the Hashemite Kingdom of Jordan and it covers an area slightly smaller than INDIANA. SAUDI ARABIA borders it on the south, IRAQ on the east, SYRIA on the north, with ISRAEL and the West Bank territories (Palestinian Hills) on the east. Jordan is almost landlocked, with a small coastline on the Gulf of Aqabah, which is an arm of the RED SEA. Jordan has two major land features—the Jordan Trench, and the Jordanian (Transjordan) Plateau. The Jordan Trench is a part of the Great Rift Valley extending from Syria to MOZAMBIQUE. It holds the Sea of Galilee, the Jordan River, and the DEAD SEA, all of which are below sea level. Shortly after the Jordan River leaves the Sea of Galilee it joins the Yarmuk River. The Yarmuk is Jordan River’s principal tributary south of the Sea of Galilee, and the Kingdom’s border with Syria. From there, the Jordan River meanders south until it empties into the Dead Sea; below sea level, it is the lowest surface area of the world. The lack of an outlet and the high level of evaporation have made the Dead Sea an area of extreme saltiness. It is mined for chemical resources including phosphates and potash. South of the Dead Sea is the Dead Sea Valley (Wadi al-‘Arabah). It stretches 111 mi (179 km) from the Dead Sea to the port of Aqabah. It is a very dry area with limited agricultural use. The Jordanian Plateau is the second prominent land feature. Most of Jordan lies on a tilted plateau. It rises abruptly at the eastern edge of the JORDAN VALLEY and the Dead Sea. The plateau’s greatest heights are at the edge of the Dead Sea Valley. The heights range from 2,000 to 3,000 ft (610 to 915 m). The Jordanian Plateau borders the Jordan Valley. Forests cover parts of the northwestern part of the plateau, while brush covers the central and southern sections. As it descends gradually to the south, east and north it becomes the Jordanian Desert Plateau. It ends in the Great Syrian Desert with little to identify the boundaries between Iraq, Syria, and Jordan. Grasses grow along the western edge, but much of it is featureless and arid. The southern portion of the Jordanian Plateau is part of the Arabian Plateau. It has many deep canyons and mountain elevations rising to approximately 4,900 ft (1,500 m). The area holds the Wadi Rum, which has strange rock formations called jebels, and Petra, capital of the ancient Nabateans. The OTTOMAN EMPIRE built the Damascus-Medina Railroad (Hejaz Railway) in the region, which is still operating as a local line. During World War I, Colonel T.E. Lawrence, British army officer and leader in the Arab revolt, inflicted great damage on the Ottoman army along the rail line. Many scenes in the movie Lawrence of Arabia were shot here. Jordan’s climate is modified Mediterranean in the west. It has sharp seasonal variations in both temperature and precipitation. Temperatures below freezing often do occur in January in the plateau. The Jordan Valley has summer temperatures that may reach 120 degrees F (49 degrees C). Amman is usually moderate in temperature averaging 78 degrees F (26 degrees C). Most precipitation is rain (although snow and sleet are not uncommon) and falls in the winter season. It averages about 26 in (66 cm) in the northwest corner of the country to less than 5 in (12 cm) in the extreme east. The Jordan River Valley and the desert in the east receive less than 2 in (5 cm) of rain per year.